Albion made it three without defeat in all competitions with a 3-1 triumph over the Hammers at the Amex last Saturday. Hughton hailed that display as one of the best his squad have served up this season and wants to see more of the same as they head to Stoke City on Saturday. 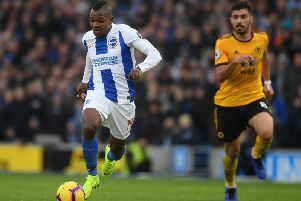 Brighton, who moved up to 13th in the Premier League after seeing off West Ham, go to Paul Lambert's third-from-bottom Stoke for what could prove a crucial fixture. Hughton succeeded Lambert as Norwich manager back in 2012 and is all too aware of the threat The Potters carry. He said: "It will be difficult because they (Stoke) are in good form at this moment. We've watched their last few games and sometimes that can happen when a new manager comes in. They are playing a different formation and their performances have been good. "I'd like to think we are in better form but we'll need to show that to get something from Stoke. Our last game at home was arguably our best in terms of looking like scoring goals but this is an away match, we'll have to play well to get something." Albion are five places and three points clear of Lambert's Stoke - in 18th - who currently occupy the final relegation place in the Premier League. But Hughton knows how quickly things can turn, especially given how tight it is in the bottom half. Just seven points separate bottom-side West Bromwich Albion and 12th-placed West Ham. "You look at Watford's result at home to Chelsea and every time something like that happens it looks like a huge result," Hughton added. "It is tight (at the bottom) and it will be the team that shows a little bit more or is able score goals that can find themselves out of that group of teams at the bottom.
" I see the incredibly competitive trend continuing, it seems like any game between two of the group of teams at the bottom instantly becomes bigger for both teams."